Violent Python shows you how to move from a theoretical understanding of offensive computing concepts to a practical implementation. 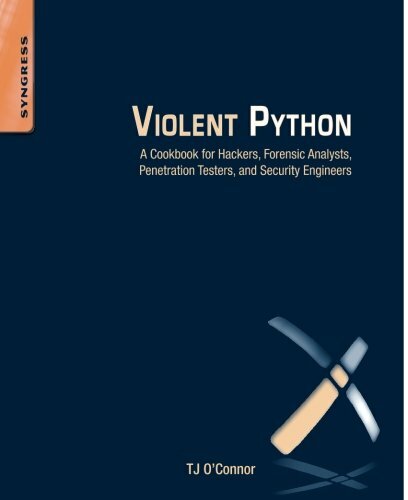 Instead of relying on another attacker’s tools, this book will teach you to forge your own weapons using the Python programming language. This book demonstrates how to write Python scripts to automate large-scale network attacks, extract metadata, and investigate forensic artifacts. It also shows how to write code to intercept and analyze network traffic using Python, craft and spoof wireless frames to attack wireless and Bluetooth devices, and how to data-mine popular social media websites and evade modern anti-virus.